All Web surfers know—or should know—that even though they often use the Internet in the privacy of their homes, they are not alone. The Web, while a window to the universe, is also a conduit for transmitting private and personal information to prying eyes. Marketers track your every move with a variety of digital markers, such as cookies, Web Bugs, or clear GIFs. Family members and associates who share your computer also can view information that you’d rather keep to yourself, such as Internet searches, websites you’ve visited, or videos you’ve watched. Of course, you could use the Safari or Firefox built-in Private Browsing mode or simply remove information, piece by piece, but the latter would be a time-consuming and labor-intensive process. SecureMac’s PrivacyScan (Mac App Store link), which debuted at Macworld|iWorld 2012, offers a one-stop way to mitigate common privacy concerns by identifying and destroying Internet files placed on your computer that track your usage and reveal your online activities to others. You can choose to erase information from a number of programs simultaneously, and then choose the level of destruction you’re most comfortable with. Time is the tradeoff; The more securely the information is destroyed, the longer the process takes. A nice byproduct of using PrivacyScan is that it has the potential of slimming down your Mac by clearing your hard drive of extraneous, space-hogging files. 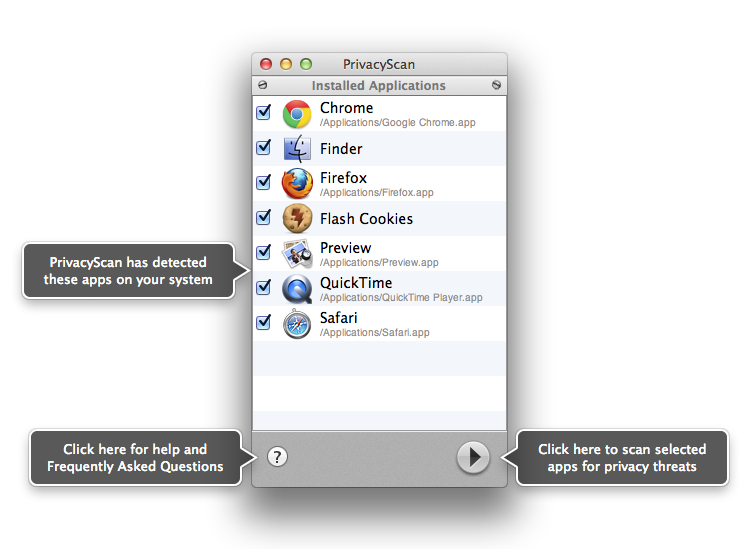 PrivacyScan supports a range of browsers and apps, including Camino, Chrome, Firefox, Flock, iCab, OmniWeb, Opera, Safari, SeaMonkey, and Shiira. It also targets potential privacy invaders like Flash Cookies and native Mac apps such as the Finder, Preview, and QuickTime. Nothing could be easier than running a scan. Launching the app reveals all the supported applications you have on your hard drive. 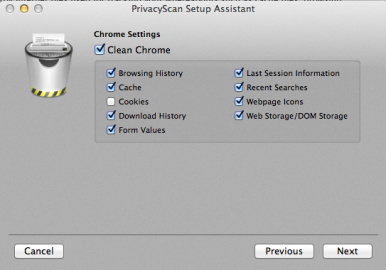 You use the setup assistant to specify which privacy issues you want the app to concentrate on; These issues include browsing history, cache, cookies, download history, form values, last session information, recent searches, webpage icons, Web storage, and DOM storage. When you hit the Scan button, the program displays scan results—a list of all the items it intends to clean. You can still change your mind about any of them before clicking the Trash icon to execute the cleanup. Even after your first scan, those choices are not set in stone. You can tweak these settings anytime in the program’s preferences. Every time you run the program, you check which apps you want scanned, and then click the arrow button to initiate the scan. According to SecureMac, PrivacyScan’s most secure shredding goes above and beyond United States Department of Defense deletion standards by overwriting files with up to 35 passes. With regular cleaning, files get about seven passes. Despite its ease of use and efficiency, a few flaws make this program less than ideal. First, in order to collect and clear files from an application, the app has to be closed before PrivacyScan can search it—a trivial issue and hardly a deal breaker. 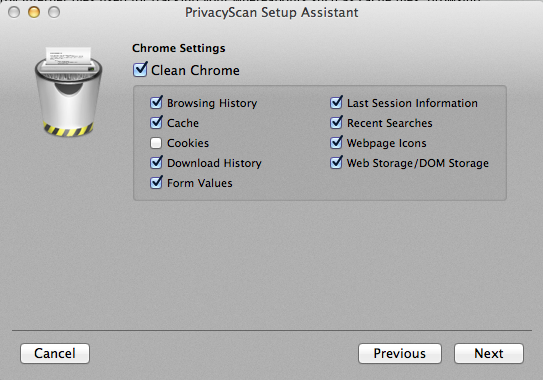 More importantly, using PrivacyScan is an all-or-nothing proposition within browser categories. For example, if you want to get rid of some but not all of your cookies, the program offers no way to differentiate between cookies you want to keep (such as the ones that control settings your Web email) and cookies you want to dispose of, like third-party ads. Inexplicably, even after ridding my browser of cookies, at least a half dozen database storage and application cache cookies still remained intact. Moreover, there’s no way to automatically schedule a hard drive sweep; you have to remember to initiate the process. The one-stop-shop sounds more complex than it actually is for native apps like the Finder. 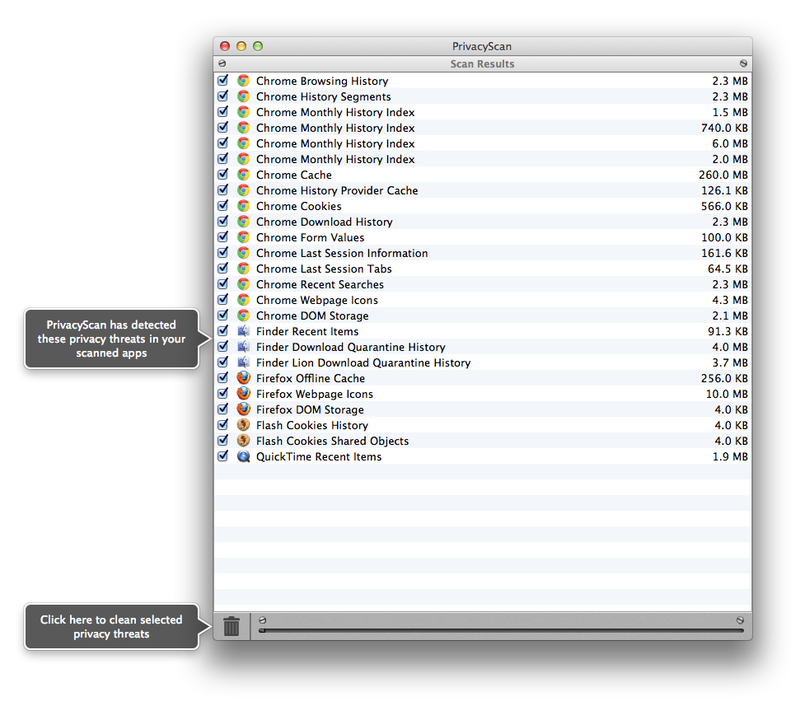 If you want to clear the history from the Finder or Preview, it’s easy enough to do that within the programs. Nonetheless, if you’re looking for the convenience of eliminating telltale information quickly, securely, and with a wide swath, PrivacyScan may be just the ticket.